Over the course of 20 years and three books, NIU Professor of History Aaron Fogleman has established himself as one of the leading lights in the field of historical inquiry known as Atlantic Studies. 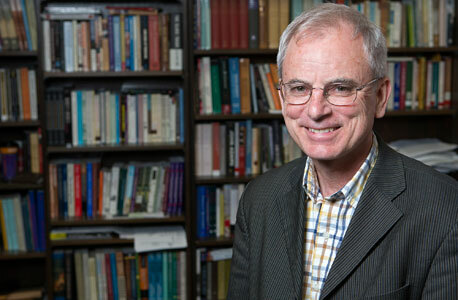 Scholars at home and abroad hail his study of migration from Europe to America in the 18th and 19th centuries for the insights he generates through meticulous archival research and his ability to expand the understanding of early American history by placing it within the broader context of the era. “Aaron’s work is as well-known – perhaps better known – in Europe, and that is a result of his ability to locate early American history in its widest context, whilst contextualizing it for both American and European audiences. That is rare, and I can think of only a few scholars in the world to do so,” says William O’Reilly, director of graduate studies at the University of Cambridge, which boasts the largest history faculty in the world. Fogleman also has many fans among academics in Germany (much of his research concerns German immigrants) where he has spent significant time teaching and researching. He has twice served as a visiting scholar at the Max Planck Institute for the Science of Human History in Goettingen, Germany and was awarded the Fulbright Distinguished Chair in American studies, at Goethe University in Frankfurt, Germany, in 2008-2009. He boasts a similarly impressive pedigree when it comes to publishing. His work has appeared in leading journals in Europe and in America, including the Journal of American History and the William and Mary Quarterly. All of that said, it is Fogleman’s books that attract the most attention from his counterparts. When his first book, “Hopeful Journeys,” was published in 1996, the Journal of Early Modern History called it “required reading” for anyone looking to understand ethnicity in colonial America. Fogleman generated similar excitement in 2007 when he released “Jesus Is Female,” which examined the role of gender and the Moravians in religious conflict in colonial America.” Reviews in American History predicted that the book would become a popular course text for years to come. All of that praise paled in comparison, however, to what greeted his 2013 work “Two Troubled Souls,” which traces the lives of an adventuresome married couple who, as missionaries, traveled Europe, the Caribbean and North America during the 18th century. He uses their personal history to illuminate the many challenges of that era in the Atlantic world and the role of religion, gender and marriage at that time. The book received the American Historical Association’s 2014 James Rawley Prize, which honors the best book exploring the integration of Atlantic worlds before the 20th century. Fogleman plans to use the proceeds that come with the honor of becoming a Presidential Research Professor to further his next book project, which comes as good news to those in his field who look forward to him pushing Atlantic studies to new levels.